Many thanks to all our users and those who submitted bug reports and feature requests. We have made a lot of bugfixes and added some great new features to version 5, and we’re sure you will enjoy it. This is a free upgrade. Just use your previous versions’ Product Key and you are good to go. You can find your product key in ControlMyJoystick’s About screen. The new version gives you new features, an easier user interface, built-in tutorial profiles, better performance, and lower memory usage. Here’s the new and improved Curve Editor, now with more contolpoints for better control. We’ll update the knowlege base and website stuff showing the new version soon. In the meantime, you can get the new version on the Download page. Here are the release notes. Enjoy! IMPORTANT – Make sure you export your profiles as .cmj files from your earlier version of ControlMyJoystick. In more recent versions, this was done automatically on shutdown. You should find them at: C:\Users\YourName\Documents\ControlMyJoystick. You will need to import these into ControlMyJoystick. Note: This is a free upgrade. Your 4.x existing product key will work fine on this version. Note: Update your 3DxWare10 version to 10.5.5 or higher. This is a fairly large code rewrite. The GUI was been heavily tweaked and the method of storing profiles has changed from a database to JSON files. This will make it easier to maintain and add new features in the future. If you have exported your existing profiles to .cmj files, you can go to the new version’s Profile menu/import and import them. Several tutorial profiles have been included. Yes. Finally. Controller button names are now shown in more readable form (‘Fit’ instead of ‘VK_FIT’). The triggers and script grids have been moved to tabs. Changed the UI to a tabbed interface for easier navigation and expandibility in the future. Changed the Threads grid to ‘Running Macros’ and included it in the new Log tab. Logs can now be auto-backed up to the PublicDocuments/ControlMyJoystick/Logs folder. This is enabled by default. 3DXWare – The axis indicator gauges now show the raw axis position data on the top, and the curve-adjusted position data on the bottom. This allows you to see the effects of curves. By default, curves are flat so you won’t see a difference between raw and curved positions until you modify the curve. 3DXWare – Curves now have an additional 4 controlpoints for better granularity, for a total of 21 (10 on either side of center). 3DXWare – Curve editor has been replace with a much better UI. 3DXWare – Curve editor now has the digital controls on the editor form instead of spawning a separate form. 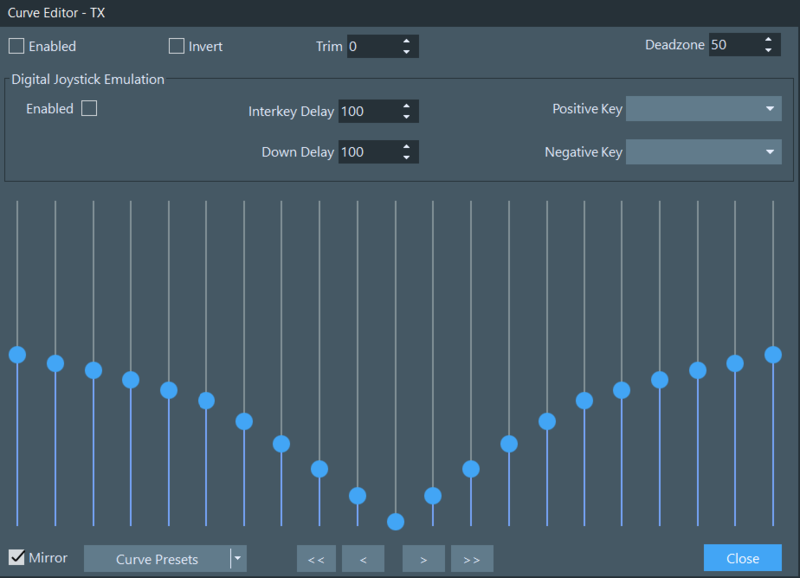 3DXWare – You can now create a new default curve group. There is now a News tab that will show any new ControlMyJoystick news such as new versions, etc. This checks for new news once every 30 days. Added the ability to include notes. This can be used to explain how to set up the game to use the profile. Profiles now are stored as .cmjson files which are different format from the previous .cmj files. 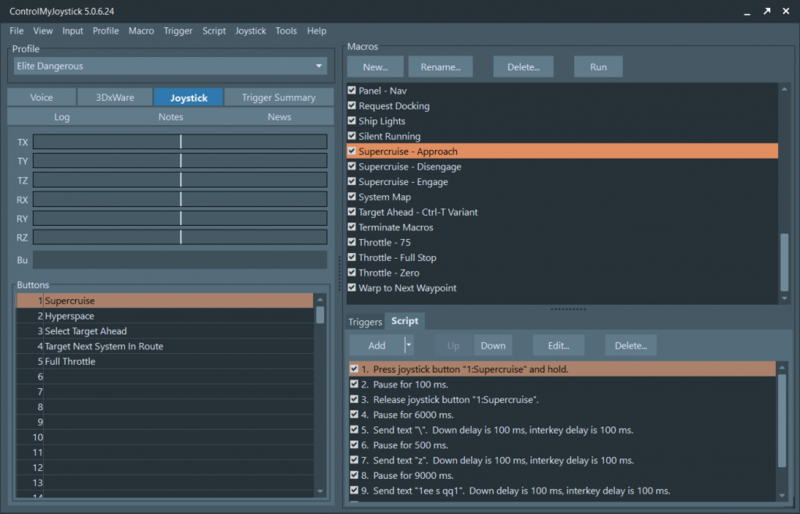 Previous versions of ControlMyJoystick used a Firebird database to store profiles, but this has been removed and all profiles are now stored in JSON format in the PublicDocuments/ControlMyJoystick/Profiles folder. This has resulted in slightly faster performance and less code complexity. You can now launch Windows Explorer to view the profile folder. Profile backups on shutdown are enabled by default and stored in the PublicDocuments/ControlMyJoystick/Profiles/Backup folder. The triggers are now displayed in a more readable form. You can now export the trigger summary as .csv so that you can print out reference cards etc in an external app (like excel). The script command lines are now displayed in a more readable form. You can now add a “Comment” script item for documenting your script. You can now add a “Change Profile” script item for making another profile active. This allows you to break your macros, joystick buttons and curve settings across more than one profile for the same game. So you could have ‘GameName – Flight Mode’ and ‘GameName – FPS Mode’ or something like that. Bugfix: Syncronous Macro’s now work. You can now use as many nested and sub-nested syncronous and non-syncronous macros as you want.